Screening of On the Bride’s Side. We would like to invite you to the upcoming Visual Dialogues screening and Q&A organised by Screen Studies at Drama and the Granada Centre for Visual Anthropology. 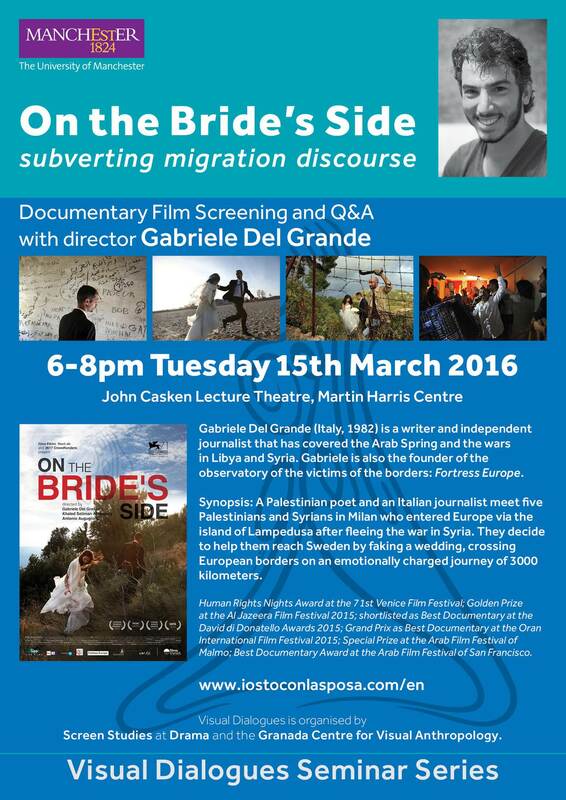 We will be screening the Italian documentary film On the Bride’s Side (2014). The film deals with the Syrian refugee crisis and it will be followed by a conversation with the director Gabriele Del Grande and co-producer Alexandra D’Onofrio (PhD candidate in Anthropology, Media and Performance). Synopsis: A Palestinian poet and an Italian journalist meet five Palestinians and Syrians in Milan who entered Europe via the island of Lampedusa after fleeing the war in Syria. They decide to help them reach Sweden by faking a wedding, crossing European borders on an emotionally charged journey of 3000 kilometers. Best Documentary Award at the Arab Film Festival of San Francisco.